As #blogchat has continued to become more popular on Twitter, it means that more people are discovering the chat for the first time, which is awesome. I'm seeing new participants every week. 1 - Understand that you have to make deposits before you can make withdrawals. What this means is that if you expect the #blogchat community to pay attention to your site, you need to first pay attention to the #blogchat community. You need to 'earn' the right to our attention. How do you do this? One good way is to first PARTICIPATE in a few #blogchats. Give us a chance to get to know you, who you are, and why we should care about what you are doing on your blog. And an important clarification needs to be made here. By 'participating', I don't mean that you simply start linking to your blog posts DURING #blogchat. No, I mean that you join in the DISCUSSION happening during #blogchat. 2 - Stay on topic. If next week we decide to discuss ways to analyze your blog's stats to optimize content and YOU link to your latest post on choosing a Wordpress template AND you add the #blogchat hashtag to your tweet, then you are spamming the #blogchat channel on Twitter. Period. 3 - Promote other people. Let's say in the above example you clearly haven't written a post associated with that #blogchat topic, but you know that Jake has. Link to his post and add the #blogchat hashtag. By doing this you are creating value for the #blogchat followers and participants. This GREATLY improves the chance that we will click your next link. 4 - Use common sense. This isn't rocket science people, it's just social media. If you never participate in #blogchats and the only time we see you use the #blogchat hashtag is when you are tweeting a link to your newest blog post (that has nothing to do with the current #blogchat topic), then you are spamming us. And you know you are, so stop. It's not providing any value for us, and as a result, it's not helping you either. 1 - Participate and join in on #blogchat discussions. 2 - Only promote your links if they are relevant and add to #blogchat discussion. 3 - Promote the work of other #blogchat participants. 4 - Use common sense. If it even smells like spam, it probably is. Well said. I was looking forward to this post today. Etiquette is always a key quality in this space. It's nice to see education such as this post continue to be there to help all social media enthusiasts. Perfect timing on this. I imagine more and more people including fairly new Tweeps are now discovering chats so it's helpful to give them some guidance along the way - we were all newbies once. Overall I think we can apply the same principles to chats as we do to replies, comments on blogs, answers on LinkedIn and anywhere else we interact. As long as we stay on topic, and add ideas that further the discussion, it's fine to share links. For example here I might share Twitter chats: if you can't meet in real space, meet in real time. which offers an introduction to the concept of Twitter chats for those who've not participated before. But I wouldn't link to my posts on SEO or blog navigation. I also think it's appropriate for folks to share links to their blogs either when they introduce themselves or towards the end of the chat, so we can see what other folks are writing about. To that end I'm collecting them on Delicious at http://delicious.com/hacool/%23blogchat. Links are great, they and any comments just have to be shared in the appropriate context so that they propel the conversation forward rather than causing it to veer off on the wrong tangent. Cheers, and thanks for another great chat last night. I've got to say that I don't totally agree with this. first off, using screen shots of people's posts to leverage your own blog is sort of hypocritical. Secondly, nobody owns the channels and there are no rules in regards to how hash tags are to be used. I met many contacts through the channel from simply posting links to my new blog posts and, in my opinion, that is what matters. The tags are there to connect with other people who could potentially follow your work and vice-versa. To say that I have to put in a certain amount of hours before I can use the channel is rather ludicrous. It's not a fraternity. Ryan you are right in that no one 'owns' hashtags and there aren't any rules for how to use them. But there ARE common sense rules. For example, you've been using the #blogchat hashtag for a couple of weeks now to promote your new blog posts. And more than once, I have invited you to please join #blogchat as we'd love to have you. You never have. So the only thing I can take from that is that you aren't interested in being an actual member of the #blogchat community, you just want to leverage the popularity of the #blogchat hashtag in an attempt to promote your blog. This is where 'common sense' needs to kick in. What would your reaction be if I started coming to your blog every day and left a comment asking your readers to check out #blogchat? Probably the same one I have when I see you adding the #blogchat hashtag to links to your new blog post, right? I didn't write this post because I want you to stop using the #blogchat hashtag to promote your posts, Ryan. I wrote it because I wanted you to do this MORE EFFECTIVELY and without honking off members of a community that you seem to be purposely ignoring. Again, it's about making deposits first, then you can make some withdrawals. Why don't you make an effort to participate in the discussion happening in the next #blogchat? It will be this Sunday nite at 8pm central, hope to see you there! There is a difference going onto someone's personal blog and using it for "leverage" as you would say and using a social networking website's services as "leverage." Like I said there are no rules and any "common sense rules" are subjective, and in no way are standardized enough to require others to obey. Also your first comment that I actually received @ me was re-tweeting my post and inserting "i like to spam" (or something close) in place of the hash tags that I used. That, to me, isn't an invitation. You have since deleted the tweet it would seem, but that hardly made me want to have anything to do with you. I looked back through your history and see one on April 18th but it is not in my history of "@" messages. Could be a problem with Tweetdeck? I'm not sure but the first message I ever received from you was the one that I mentioned above. And since you seem to have taken over the role as spokesperson for the entire channel I would only be able to deduce either that a) the channel accepts your statements as their own personal beliefs as well or b) that you are using the channel to add strength to your personal concerns with me...which seems like leverage. Again you say all of this but are using my tweet and another member's tweet to gain "leverage" on your article on your blog. I am confused because it seems like you are using other members on twitter (both myself and the other user that you mentioned in the article as well as the entire channel of #blogchat) to gain leverage for your blog as well as your opinions. Ryan I see no difference. If you accept comments on your blog (honestly I've never visited it so I have no idea), then how would you feel if I started leaving comments on your blog promoting #blogchat? Or how would you feel if a dozen people that had never commented on your blog, suddenly started leaving comments promoting #blogchat, and not doing anything to contribute to the discussions about your book? I think most people can conclude that you would likely think these comments weren't relevant, and possibly spammy, right? You would probably be tempted to delete them, right? They probably wouldn't make you any more likely to want to participate in #blogchat, right? As for my being the 'spokesperson' for #blogchat, let me explain that. I created #blogchat in March of 2009. Since that time, a vibrant community has evolved there of several hundred people that come together every week to discuss blogging. I *love* these people, and appreciate the hell out of them for creating this amazing community. So with that disclaimer in mind, when I see someone such as yourself that is attempting to leverage the #blogchat community to promote their own work without BEING INVOLVED in that community, then I get defensive. Because that comes across as someone trying to take advantage of MY community. 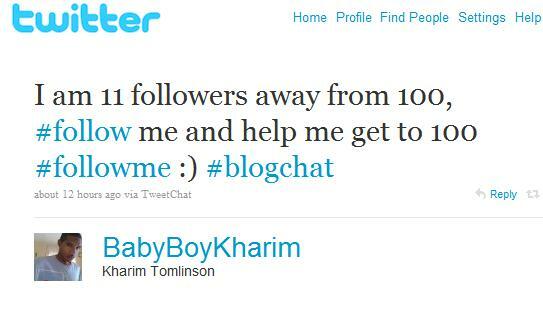 And I have also received emails and @s and DMs asking me 'who are these guys spamming the #blogchat channel?' THAT was the big thing that prompted this post. Because I honestly DO want you to join the #blogchat community and contribute in a way that creates VALUE for you AND us. Ryan I never said you are breaking any rules, because as you stated, there are no rules. I will invite you once again to please join #blogchat this Sun nite. I have to stress that there is most certainly a difference between the two. One is a group of bloggers who gather with the purpose of exchanging information regarding blogs under an organized space; this being #blogchat. So posts that fall under the topic of blogs fit nicely under the heading of #blgochat. If I began posting tweets such as "just got a new car #blogchat" then I can see your complaint. I am, however, not doing that. If you wanted to create an area of webspace where bloggers can form a community to discuss the art of blogging then I would recommend a forum with chat box, not twitter. This varies significantly from going onto someone's blog and posting information that is irrelevant to the work on the blog. I hope now you can see the difference. Since you have been the creator of #blogchat I would have thought this issue would have come about sooner since I've used the channel long before a couple of weeks ago to promote other blogs that I've had, ranging from poetry, to comedy articles about pop culture, to music. I suppose that adds to the confusion I'm having since it seems to only recently be a problem and the frequency which I use it now has severely decreased compared to the past. Maybe it is because (as you stated) now the "community" is "vibrant". Is it possible that you have become more selective with how it's used but when it was still growing up you welcomed the use of it to spread the name? I'm not sure, but tactics like that are more a reflection of the shift in YOUR values and not mine. I have always used the channel as I have been recently and never heard complaints until now. It would also appear that you thought I was breaking "common sense rules" as you said in a previous reply. That was what I was taking issue with because I think I am abiding by common sense in using a hash tag to get my voice out to a larger group of people who share in the interest of blogging, just as I do with #writechat and #litchat, without any issues arising, mind you. I may very well join on Sunday for the discussion as I am in no way opposed to discussing blogs with fellow bloggers. I just don't think it's fair to make users on twitter (who actually use the channel for information regarding blogs) out to be some sort of immoral rule-breakers if they aren't active participants in the "community." I have to stress that it seems your goals for this "community" would be best suited for a forum which has much more structure and focus than twitter channels. Ryan there's clearly a difference in the tools being used to facilitate the discussions, one is a blog, one is Twitter. 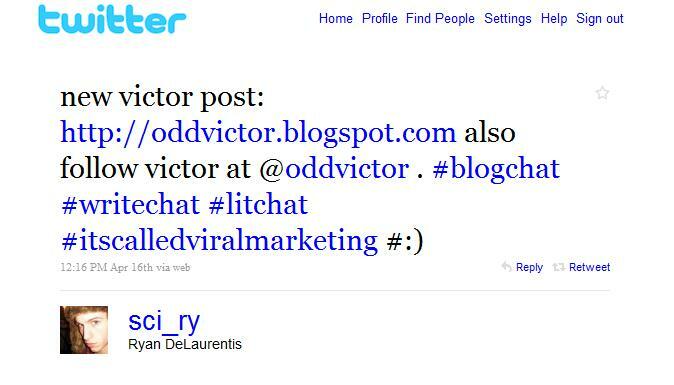 But there's no difference between my going to your blog and promoting #blogchat to your community and you coming to #blogchat and promoting your blog about some guy named Victor(is this correct?). Both instances are seen as an outsider coming into a community and attempting to capitalize on that community to promote their own efforts. I think you are smart enough to agree with this. As for why I am addressing this now, again, because it's become more prevalent in the past few weeks AND because I am beginning to get complaints from #blogchat members. I was willing to overlook it at first, but when my community started letting me know that they didn't like these tweets, I decided to write this post. "It would also appear that you thought I was breaking "common sense rules" as you said in a previous reply. That was what I was taking issue with because I think I am abiding by common sense in using a hash tag to get my voice out to a larger group of people who share in the interest of blogging, just as I do with #writechat and #litchat, without any issues arising, mind you." And this is another reason why I wanted to write this post. Your goal, as you clearly stated, is to leverage these hashtags to get your voice out there. But the problem is, you are attempting to 'get your voice out there' to a community that you have (purposely?) decided not to participate in. Since you have decided not to participate in the #blogchat community, it comes across as a disconnect for you to attempt to leverage #blogchat to promote your own work. Again, I think you are smart enough to see this. If you REALLY want to get your voice out there about your blog, this is my advice. This WILL work for you, but it will require that YOU do a bit of work as well. Go to writer-themed chats on Twitter, and participate. Don't promote your blog, become a part of these communities. Join the discussions there, and let the members there get to know you, and THEN after they do get to know you, they will want to check out your blog. There are no shortcuts to creating a community around your efforts. This is why I keep stressing making deposits FIRST, then withdrawals. Your approach is coming across as if you want the #blogchat community to check YOU out, when you have told us that you do NOT want to check US out. Again, I am sure you are smart enough to see this. BTW what do the rest of you #blogchatters think? Also, if you think I am dead wrong, let me know. In the end, I want what's best for the community as a whole. Which means what YOU want outweighs what I want. I can only speak from what I have seen and heard from some of you. If others think differently, please let me know. Again we aren't seeing eye to eye on the differences between me marking posts about a blog as #blogchat and you coming to my blog and posting information that has nothing to do with the work. The "work" of #blogchat is a group of bloggers discussing blogs and sharing blogs. I participated by sharing my blog. To go to someone's blog and advertise your channel on twitter has nothing to do with the topic of my blog. If my blog were a blog to network other bloggers (as it seems #blogchat is) then your statement would be valid. However, that is not the case. In regards to leveraging communities, I am not thinking that hard about how to manipulate an entire group of people for my gain; it's not in my nature. I simply was trying to put my work out there to people who I know are interested in work of that format (i.e. bloggers and writers) in hopes of accruing more followers (whom I would follow back). That is all. I do not think that one has to be an active member of "your" community to be able to use "your" hash tag in their posts. Again, I recommend that you look into forums if that is how you view hash tags because to lay claim on when people can use "your" hash tag in a post is coming across as something more akin to elitism than an open community. I respect your advice to participate in the "communities" and I very well may do that. But I think that to include me in a post about spammers using chats for leverage is unfair. The screenshot that you used in the opening of your article is doing something far different than what I was doing. It fit much more closely to the "I got a new car" example that I proposed in a previous post than what I was doing which was simply getting my work out there. Finally, throughout your response you attributed your statements with "smartness." I have to say that I find that rather arrogant, and trying to pass it off as a compliment ("I'm sure you're smart enough") is even more sneaky and really is just a back-handed compliment. I clearly understand your position but I disagree. It has nothing to do with my level of intelligence (nor yours) and attributing the idea of "smartness" to your opinions shows more of what you think of yourself and less of what you actually think. This argument is extremely interesting. As a fellow chat founder, I understand how you feel, Mack, when people come and just post links without actually participating. You love your community, and hate to see it mistreated. I think Ryan does bring up some very valid points. The fact is, the chat is run on a hashtag on a completely open forum. While twitter is an amazing platform to bring people together in discussion, being completely open has it's downsides too. I'd argue too, that blogchat has a core community that shows up pretty regularly and that knows each other pretty well. Outside of that core, however there are people who come and go, there are always new faces, and they may not see it as a community, the same way the core community does. They may see it as any other hashtag, used to make tweets findable, and organize information. You can't prevent someone from using a hashtag however they want. A hashtag is open for anyone to use however they see fit, regardless of who claimed it to be their own. It would be like going into union square with 1000 people to play frisbee. Then when a skateboarder comes and gets in the way of a frisbee toss, you tell them they can't do that because union square is for playing frisbee. If someone wanted to start a blogchat today, and say that it's a hashtag used to share blog posts about blogging, there's really nothing we, the original blogchat community, could do about it. That's why with the chat I helped build, we're looking into ways that we can build the community on other platforms. The twitter chat will always be there and will always be a focus, but a hashtag can never be your own. A hashtag belongs to everyone. Your points are absolutely valid. I believe that Mack is offering some advice for how you can better utilize blogchat. Like any other social platform, simply going out and sharing links to your stuff may give you some return. Actually engaging with the community first, however, will promise greater return as members will be much more receptive and open to reading and sharing your work if they recognize and trust you. So while no one can stop you from posting your links during the chat without participating, you'd find greater return by actually participating, and you wouldn't offend those that consider the chat to be a community of trusted individuals. First, I love that you're having a respectful, smart dialogue about this, and you're both making some excellent points. I think what may be causing a bit of the disconnect is that it appears Ryan sees #blogchat as a vehicle through which to communicate with others about blogs in general - which can be interpreted quite broadly. People who have participated in a live version of #blogchat are more attuned to the mission of #blogchat as stated by Mack on "What the Hashtag?!" -"Bettering Your Blog." Thus, if I use the #blogchat hashtag during the week I try very hard to ensure that I am sharing content with the community that will help them make their blog better. So, what may be causing a bit of consternation, perhaps, is the more recent use of the hashtag to promote particular blogs in general, rather that to focus its use on sharing ideas and advice with the community to help each other become more successful. Perhaps a new hashtag (something like #blogshare) could be created to allow both missions to be met, yet with different vehicles? Personally, I look at this as spam. Personally, I would never visit any of the links posted in such a manner. But....I think it's in the manner of who/when they are posted. If I were to blindly attach the #blogchat hash to my tweets during Sunday evenings while the chat was happening, it's clearly untargeted spam that's simply trying to draw on the popularity. However, if the topic of #blogchat was ethics, for example, and I wrote a post about ethics..I could see somewhat of a relevance. Ryan, I think the big issue is that you have a misunderstanding of what #blogchat is. While it's about blogs in general, each week usually has a topic. So again, if last week's topic was ethics and you have a post about something completely irrelevant, do you see how it could come across as spam? Again, I wouldn't click on any link such as the ones above. My view is similar to Mack's and clearly feel it's trying to get hits without being targeted or relevant. But I also see a bit of where Ryan is coming from. Either way..keep it relevant, keep it targeted. And participate in the chat and build a community rather than bling tagging in hopes of hits. I'm also enthused by the discussion that has come from this. I think the sides CAN (and should) be seen as differing rather than opposed. This would also remove the feeling of one side being right vs. the other side being wrong. Because in all honesty being labeled a spammer has tons of stigma attached to it that I don't think, in my case, is really relevant. I think the opinions are very valid based on what I've read and I commend Mack on forming such a tight-knit group. I do still agree with David's point of trying to play Frisbee in Union Square, which is what lead to my suggestion of a forum. I have had great experiences in the past with making them and forming great friendships form them while still having good clean records for anyone to access due to the nature of a forum. Kasey, I see your point, but I still think that you can't expect everyone who may use the tag to be fully engaged in the specific topic of the week. The general idea behind the tag is sharing ideas and blogs with more specific topics for the dedicated members. Goes back to the point about Frisbee in Union Square. But like I said I do have respect for the group, and I don't want my using the tag to be seen as anything disrespectful. I suppose I just wanted to clarify that I'm not a villain trying to use a group for hits. I am not opposed to connecting with any number of you and as I said I used the hash tag mainly to get my name out there in hopes of reaching people with similar interests. I never wanted to take advantage of a group of people to accrue hits without getting to know them. As a matter of fact my blog is formed on the exact opposite principles. It is dependent on user interaction so I'm far more concerned with relationships as opposed to numbers. Something which I could explain some more in the engaged chat session. Again, I may very well join the chat on Sunday and get a chance to talk with you all some more, but I just wanted to clear my name, so to speak, from being made out to be too villainous when all I have been doing was trying to share my work with users that had similar interests, and I don't think I necessarily fit in the same category as the first screenshot that Mack used to open his post. Lisa I love your idea for a #blogshare hashtag. Ryan does that sound like something you would like to start? It would be GREAT promotion for you and your blog because when people start using it, others will ask how it started and they can explain that YOU started it. And it would also be a great way to share and discover new blogs! I think it's a win-win for everyone. What do you think, Ryan? I meant to address that in my last post. I may very well create that tag. If I do I would also appreciate it if users who would post links to their blogs in #blogchat could also give #blogshare a mention to help build up some momentum. Again, it's about connection not numbers. Otherwise, I'd just make a channel called #givemehits or #hitmebabyonemoretime, lol. *Sigh* As this space grows, we are certain to feel the pain of fabric stretching. I participate in a few chats and can honestly say they are more than a hashtag but a community of professionals I like and respect. I use the hashtag to promote the community and share information relevant to discussion topics. While no one "owns" hashtags I would not knowingly use a community hashtag for non-related purposes. Many may not realize that regular participants in the chats use tools such as Tweetgrid and Tweetchat to review past chats and content shared so yes it would be a little annoying to see it routinely used for other purposes. Yet, I am also aware that everyone may not share this opinion. I don't agree that the twitter chats are any different than forums or blogs, we are using a tool to form community and chats enrich the entire experience. I only hope that we can continue respectful and open discussion and debate. I have a whole bunch of different thoughts on this, which will probably get divided into different comments. First - Mack, I would look into doing something that PRSarahEvans does with Journchat called ONEPITCH. Everyone is reminded to keep self-promotion to a minimum during the actual 2-hour chat and knows that the last 10 minutes are open for people to promote their company, new idea, blog, etc. The community is pretty good at respecting it and also helping Sarah police it during the chat. Second, Ryan is right and there are no "RULES" about hashtags and if anyone owns them. However, etiquette is an important component in the social space. And, if you're overly aggressive amongst a group of people who should be your peers, you're not going to get very far. Third, if you've written a blog post about blogging (the blogging process, how to advertise your blog, analytics for your blog, etc. ), I see no problem with promoting / sharing that blog using the #blogchat hashtag. However, if your blog is not directly related to blogging, than using the #blogchat hashtag is just spammy. I also use the tag a lot during the week if I RT something that I think the #blogchat "community" will find of interest. Mack, thanks for being a good steward / spokesperson for #blogchat. :) I know there's a lot of people that appreciate it. The only concern thing I can take from that is that you aren't interested in being an actual member of the blogchat community, you just want to leverage the popularity of the #blogchat hash-tag in an attempt to promote your blog.Etiquette is always a key quality in this space. Creating a chat is easy. You choose a hashtag, a time, set everything up and you're done. Creating a community that actively participates is much harder. Mack has invested a significant amount of time and effort in turning the blogchat hashtag into an active community. While it is true that hashtags are not technically "owned", the people who invest their resources in making them valuable should have a say in how they are used. Capitalizing on someone else's hard work is inappropriate whether it is in an open forum or an office environment. There will always be people who make those moves. As community members (disclosure: I'm a long time member of the #blogchat community), we have a choice. We can reward the people who are using the hashtag outside its creator's vision by clicking their links. Or, we can ignore them with the hope that they will find better ways to use their 140 characters. I choose the later. The spam and noise is so intense that the actual conversation is really hard to follow. As Sci_Ry says, though, there's nothing you can do to make him and his ilk stop spamming, and apparently nothing you can do to convince him that spamming isn't "marketing", it's "obnoxious". LOL. I almost went nasal at Ty's closing comments. Here's the deal as I see it. I'm relatively new to blogging and newer still to #blogchat. But I pop in on Sunday as much as I can because in my mind #blogchat has become synonymous with on going education about the art and science of blogging. If I were to see a post during the week with a link and the #blogchat tag, unless it was from Mack or one of the regulars I am familiar with, I'd probably just ignore it. 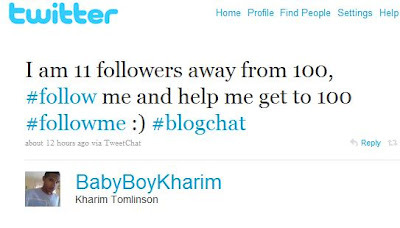 If it became annoying to me, I'd probably unfollow the person in question. If it was a blatant and obvious a technique as described here (again, I have not personally seen it yet due to limited time at #blogchat recently) I would probably "block" the user - thus ending the problem on my end, but also guaranteeing that I would never check out that users content regardless of the quality. And I'm okay with that, but is that a risk someone like Ryan is willing to take?